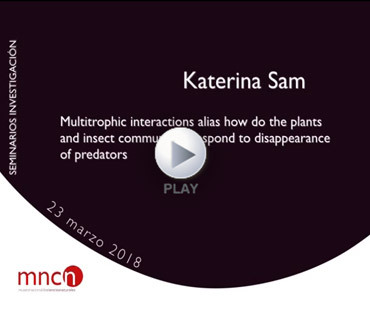 Research seminar: MULTITROPHIC INTERACTIONS ALIAS HOW DO THE PLANTS AND INSECT COMMUNITIES RESPOND TO DISAPPEARANCE OF PREDATORS. We excluded birds, bats, vertebrates and ants from focal trees along a 3500 m long elevational gradient in Papua New Guinea to investigate the changes happening to plants and insect a year after the removal of the top predators. In the experiments, we simulated herbivorous damage (mechanically and chemically by methyl jasmonate) to study the importance of induced indirect defenses of plants. Finally, we conducted similar experiments in temperate regions of Czech Republic, where we studied attractive of methyl jasmonate treated willows to birds and other predators and changes of bird's behaviour towards herbivore damaged trees. Presenta: Luisa Amo de Paz, Departamento de Ecología evolutiva, MNCN-CSIC. Ponente: Katerina Sam, Institute of Entomology, Ceske Budejovice, Czech Republic.